Our guys seemed to all hear it and stop playing. I guess it is possible they all have better hearing that multiple LSU players. It's unfortunate. Some players heard it some did. I believe it was a bit dirty though. I heard the whistle on my TV. 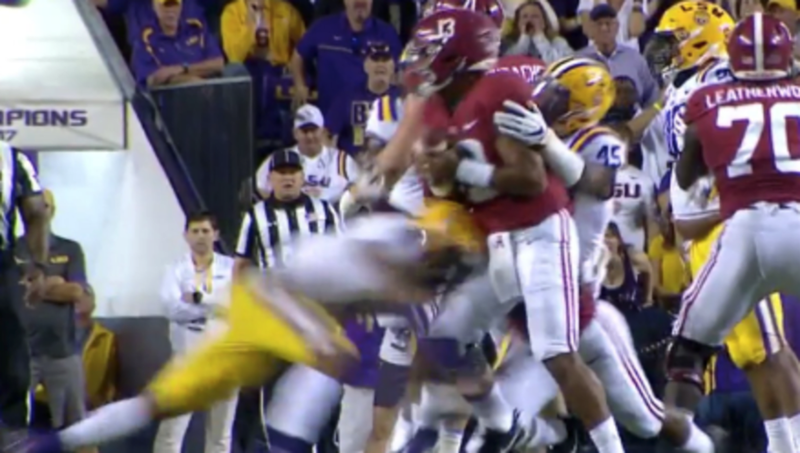 I wonder why it looked like Bama players heard the whistle and LSU players didn’t? That sure looks like Delpit is leading with the crown of his helmet. Joey Bosa ended his career with tOSU by planting the crown of his helmet into a QB’s chest and getting called for targeting. It was 1000% deliberate and dirty. I'm not wishing ill on Delpit but Karma(or whatever you want to call it) usually gets around to players like him. Honestly I credit our entire team for not letting things get overly 'chippy' to the point of multiple PF's being dished out after seeing the Tua hit and Ruggs III getting targeted in the endzone. SEC IS strangely quiet with all that don't you agree? I think a few of Mizzou's players should be called out. I think the same of LSU. I want to know why no flags thrown there. No dead ball foul or roughing the passer or anything. Why? We heard 100% more whining about Dylan Moses' push right on the sideline which COULD have been called, but GD called the foul...and then the disgust that it wasn't. Don't recall him worrying about Tua getting hammered by 2 Lsu players after the whistle. Whatever happened to the "Hey Ref...We can't hear our signals" rule?? The refs used to caution the fans. Same as the cowbell joke that we see in Starkville. Another problem I had with the refs was the PI call on Savion, ball was clearly uncatchable and they still called PI. Shouldn’t that have been targeting? If I recall, if you lead with the crown of the helmet regardless of the area, it’s targeting. for what it's worth, he did get abused repeatedly on national television. Keep in mind that this hit came with a 4 step running head start! Last edited by CajunCrimson; November 7th, 2018 at 10:47 AM. So basically nothing delpit could do could stop Bama. Got it.